Interested in Norwegian language tuition or, possibly, in brushing up your “norsk” on your own? Please feel free to browse our pages by clicking on the links (tabs) below. We have also collected some essential Norwegian language course info which you may very well find of help. We are located in Oslo, Norway and offer a wide range of one-to-one beginner-to-advanced Norwegian language lessons and private tuition courses in Norwegian, designed for foreign students of all ages and nationalities. These are especially suitable for those who require a fast-track Norwegian language immersion program for academic or business purposes. Our one-to-one Norwegian language lessons are practical, fun and tailored to your own very special needs. We focus on areas of Norwegian that you most need or want, covering pronunciation, grammar, reading and writing comprehension, vocabulary expansion and conversation practice at all levels. Our private tuition courses concentrate on grammar, idioms, sentence structure, as well as oral and written expression. They include current topics that will enable you to effectively communicate in most everyday environments. Individual attention is given, with courses geared to the exact level of the student. Our course fees are inexpensive for the quality and degree of personal attention that the students receive. Minimum age of students: 18 years or older. Tutors: All members of our teaching staff are university trained certified teachers of Norwegian with a minimum of five years of experience in teaching Norwegian to foreigners - all of them possessing a good knowledge of English as well. 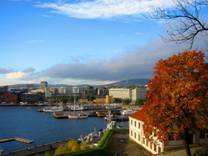 Oslo is the capital of Norway and by far its largest city, with a population of more than 550,000. Nestled between the mountain-side and the fjord, this sprawling Nordic capital boasts the most unique location and a proximity to nature that few capitals can match. Whether taking a stroll along the city's unforgettable main street Karl Johan with its talented buskers and a multitude of shops and pubs, or soaking the unique atmosphere of the fjord from one of Aker Brygge's numerous waterside cafés and restaurants, you are no more than minutes away from the vast areas of beautiful pine forests to the north or the wonderful beaches and green islands out in the fjord. This is a modern European capital unrivaled for its unlimited fresh air and breathtaking natural scenery. Still, this capital city can offer a wide range of entertainment options, as well as some great shopping opportunities. Oslo is turning into a bustling metropolis with the typical profusion of sidewalk cafés, excellent restaurants and an exciting nightlife. For those interested in culture Oslo has really a lot to offer. The city's impressive array of sights and attractions includes the Vigeland sculpture park, the Edvard Munch museum, the Viking ship museum, the Kon-Tiki museum and the National Art Gallery to name just a few. There's just too much to see and do. In addition to the landmarks and attractions above, must-see places include the Holmenkollen ski jump and ski museum, the Akershus Fortress and Castle, the National Museum of History, the Museum of Folklore... For the record, Oslo is the site of Norway's oldest university, oldest theater, and it is home to both the national government and the Norwegian Parliament (Storting). The capital city of Norway has a well developed public transportation system, which includes a large network of subway trains, trams, buses, boats and suburban trains. Bike rentals are also available. Still, downtown Oslo can best be explored on foot. Tightly surrounded by forest-clad hills and lakes, while simultaneously sprawled around the shores of the beautiful Oslo fjord, the Norwegian capital can offer splendid opportunities for outdoor activities both summer and winter. Regardless whether you choose to explore Oslo on foot, by bus, tram or by making a boat trip around the fjord, you will be overwhelmed with the intimacy this modern capital has to offer. We are open April through September subject to availability, so you need to check availability first. Upon receiving and accepting your application, we will send you a confirmation of acceptance for the course and an invoice. A non-refundable deposit of 180 euros must be paid upon confirmation of course placement – preferably as early as possible. Only then will a confirmation of course placement (booking confirmation) be sent out by NSC. No booking will be confirmed without receipt of a deposit of 180 euros. Payment of the balance of tuition fees must be made at least 2 weeks prior to arrival. If the booking is made less than 15 days before departure, full tuition fees must accompany the application form. All payments are non-transferable. Please note that in any case, we must receive the balance of tuition fees due at least 2 weeks before the commencement of your program. Upon receiving your balance of tuition fees, we will send you a final confirmation of enrolment for the course. See also Discounts, Tuition fees and Accommodation fees. If you are interested in an exact price quote for your desired period of Norwegian language tuition plus accommodation, please fill out our Enrolment Form and press send. You can pay your deposit and/or balance of tuition fees by a direct bank transfer / bank wire. You can send BANK TRANSFERS to the following bank account (IBAN): NO73 9710.1759.680. Holder: NSS, Hans Nielsen Hauges plass 7, 0481 Oslo, Norway. Bank’s address: DnB Bank, N-0021 OSLO, Norway. SWIFT Code: DNBANOKK. When paying by bank transfer, you need to insure that all bank charges are paid for by you. If you have to postpone or cancel your booking, you must inform the school in writing as soon as possible. Our office must receive written notification of desired postponement at least two weeks before your date of arrival in order to transfer the Deposits to a later course date. Cancellations done more than 2 weeks before arrival: loss of 180 euros deposit. Cancellations done less than 2 weeks before arrival: loss of 180 euros deposit plus tuition fees for two weeks. Liabilities: NSC accepts students on the assumption that they are in good health. We do not accept responsibility for: loss or damage of student’s property; sickness, injury or loss of life to any participant; loss of expenses due to delays or changes in air, rail, sea or other services, weather; quarantine, sickness, strikes or any other cause. We also advise students to arrange full insurance cover for their stay in Norway. It is the student’s responsibility to arrange all tickets and permits and to have a valid passport. Students are responsible for any damage they may cause and will have to pay the full cost of replacement or repair. Students attending NSC must abide by its rules. In extreme cases we reserve the right to suspend students for misconduct – without refund of fees. Duration: We offer one-to-one Norwegian private tuition lessons for periods of 2, 3 and 4 weeks. Minimum length of stay: 2 weeks. Maximum length of stay: 4 weeks. Flexibility: Enrolled private students are free to choose their own arrival date. Course starting dates will always fall on the weekday following your date of arrival. Students arriving on a Saturday must leave on a Saturday. Students arriving on a Sunday must leave on a Sunday and so on. Class times are normally 10-12 am, but can be moved according to preference (morning or afternoon). Certificates: Certificates of attendance will be issued on completion of any Norwegian language private tuition course or period of tuition at NSC in Oslo, Norway. 1. Application fee (to be paid 2 weeks prior to arrival at the latest): 60 euros (for administrative purposes). See also Discounts and Accommodation fees. If you are interested in an exact price quote for your desired period of Norwegian language private tuition plus accommodation, please fill out our Enrolment Form and press send. Student discount: Students get a 10% tuition fee discount off the above rates (copy of student id required). Other discounts: Additionally, a 10% tuition fee discount is given to residents of 9 Eastern-European countries: Bulgaria, Czech Republic, Estonia, Hungary, Latvia, Lithuania, Poland, Romania and Slovak Republic. See also Tuition fees and Accommodation fees. Accommodation: We arrange accommodation for our students on a homestay basis, normally in the home of your Norwegian tutor – for the exact number of weeks that have been booked for the course. We will book private accommodation in single rooms close to Oslo city center, typically in the apartment of the respective teacher conducting the language course. Rooms are of good standard and involve sharing bathroom facilities. Use of kitchen facilities is also included and will be shared. Some free use of the Internet for e-mail, etc. No smoking is allowed at any time on the teaching premises or in the student’s room. - Extra week accommodation: 160 euros. If you are interested in an exact price quote, please fill out our Enrolment Form and press send. Interested in the Norwegian language? Still having questions about how this works? Email them to us. Remember we will be more than pleased to hear from you. We thank you for your interest. Interested in Norwegian language tuition or in brushing up your “norsk” on your own? Please feel free to browse our pages by clicking on the links (tabs) below. We have collected some essential info which you may very well find of help. Copyright © 1999-2014 by NSS. All rights reserved.